I recently ran out of my Clinique Turnaround Night Cream and was debating what to try next. Don’t get me wrong. I wasn’t unhappy with the Turnaround cream, I’m just itching to try more amazing products. 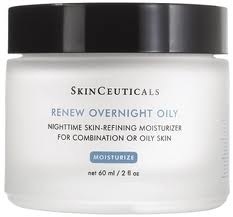 I have heard so many wonderful things about Skinceuticals that I decided it was my next step. Besides, it’s carried in dermatologist and plastic surgeon offices across the country, so it must be good, right? Right! I went with their Renew Overnight Cream for oily and combination skin. The first thing I noticed was how amazing it smelled. It’s formulated with tangerine oil to help combat acne and skin congestion. Yum! The cream is very lightweight and absorbs instantly into the skin. This moisturizer refines the skin and diminishes the appearance of fine lines and wrinkles. Botanicals hydrate while the 10% hydroxy acid blend gently exfoliates to restore a healthy, radiant complexion. What I’ve noticed so far is that my skin is much brighter in the morning, is less greasy, and looks healthier. Time will tell if those stubborn lines and wrinkles will disappear, but I’m always hopeful! please visit Skinceuticals to purchase or find a retailer near you. I hate to say it, but I still think that the Olay Daily Moisturizer with an SPF 15 in it is just as good as anything else on the market. I haven’t used anything else for years and it’s only about $8 a bottle. But I’m SUCH a SUCKER for the good smelling products!!!! I hate to say it Meg, but I still think the Olay Daily Moisturizer with an SPF of 15 @ $8 a bottle is about as good as it gets. I’m a SUCKER for the good smells though, so the tangerine sounds like a dream!